All the major navies in the world are now building them. The Russians have one of their big carriers, the Admiral Kuznetsov, back at sea and have stated that they plan to build 12 carrier battle groups. The Chinese and the Indians are also under way with plans, the Japanese are building a destroyer that will act as a helicopter carrier and the US are working on new-generation carriers. We're an island nation and we have global interests so we need these four acres of moveable sovereign airfield that we can deploy wherever we want, whenever we need them. The world is an unstable place and, post-Iraq and the global war on terror, access to other nation's territory or airspace is more difficult. Great. When have I heard this before? Maybe knowing that Dr Willett is head of the Maritime Studies Programme at the Royal United Services Institute, helps in understanding that maybe he has an special interest in this two mobile naval airbases. The carriers-which will cost $5.9 billion, a lot less than the $14 billion that the US spends on their super-carriers-will host 36 F-35s and two EH-101 Merlin multi-purpose helicopters each. • The surface of the16,000sqm flight deck is covered in a grainy,heat-resistant paint,similar to very coarse sandpaper. The entire painted surface amounts to 370 acres - slightly bigger than Hyde Park. • Two huge lifts, each with a 70-ton capacity, are capable of transporting two aircraft from the hangar to the flight deck in 60 seconds. 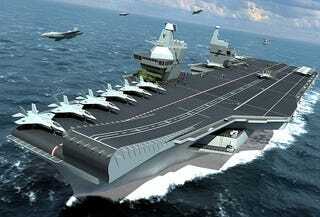 • The ground-breaking twin-island layout allows more deck space for aircraft and better visibility of the flight deck. The forward island is for navigating the ship; flight control is based in the aft island. • The ship's 29,000 sq m hangar is 150 metres in length and has 20 slots for aircraft maintenance. • There are 11 full-time medical staff on board managing an eight-bed medical suite, operating theatre and dental surgery. • Onboard water treatment plant produces over 500 tons of fresh water daily. • Two Rolls-Royce MT30 gas turbines and four diesel generator sets produce 109MW. • Cabins are spacious and cruise-liner style, with en-suite toilets and shower facilities. Officers and senior ratings have single or two-berth cabins. The maximum number of crew in a cabin is six. • The carrier will carry more than 8,600 tons of fuel, enough for the average family car to travel to the Moon and back 12 times. This gives a range of up to 10,000 nautical miles. • Top speed will be in excess of 25 knots, sufficient to cross from Dover to Calais in an hour. • The two five-blade propellers are each 30ft in diameter - that's one-and-a-half times the height of a double-decker bus.